The value of pipe #064 is n/a points. 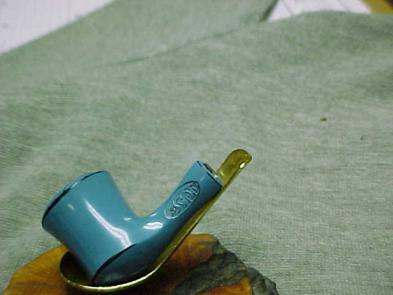 Baker Egerton told me that Mel Rudner was offering this pipe on an eBay auction. He had a couple of other briars with it in the lot. As part of our correspondence, I learned that Mel had a couple of other damaged pyrolytic graphite pipes and we arranged to swap the briars for the broken pipes. This Berkeley would have had a 1/4 bent stem originally. I couldn't locate a replacement mouthpiece and, when the collection of THE SMOKEs was complete, I had to throw this poor fellow away.